This article is about the hymn. For the type of service, see Te Deum (religious service). "Ambrosian Hymn" redirects here. For hymns written by Ambrose, see Ambrosian hymns. The term Te Deum can also refer to a short religious service, held to bless an event or give thanks, which is based upon the hymn. Authorship is traditionally ascribed to Saint Ambrose (d. 397) or Saint Augustine (d. 430). In 19th-century scholarship, Saints Hilary of Poitiers (d. 367) and Nicetas of Remesiana (d. 414) were proposed as possible authors. 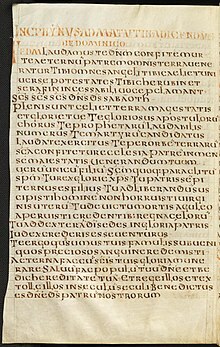 In the 20th century, the association with Nicetas has been deprecated, so that the hymn, while almost certainly dating to the 4th century, is considered as being of unknown authorship. It has been proposed based on the structural similarities with a eucharistic prayer that it was originally composed as part of one. In the traditional office,[year needed] the Te Deum is sung at the end of Matins on all days when the Gloria is said at Mass; those days are all Sundays outside Advent, Septuagesima, Lent, and Passiontide; on all feasts (except the Triduum) and on all ferias during Eastertide. Before the 1961 reforms of Pope John XXIII, neither the Gloria nor the Te Deum were said on the feast of the Holy Innocents, unless it fell on Sunday, as they were martyred before the death of Christ and therefore could not immediately attain the beatific vision. In the Liturgy of the Hours of Pope Paul VI, the Te Deum is sung at the end of the Office of Readings on all Sundays except those of Lent, on all solemnities, on the octaves of Easter and Christmas, and on all feasts. A plenary indulgence is granted, under the usual conditions, to those who recite it in public on New Year's Eve. The hymn is in regular use in the Catholic Church, Lutheran Church, Anglican Church and Methodist Church (mostly before the Homily) in the Office of Readings found in the Liturgy of the Hours, and in thanksgiving to God for a special blessing such as the election of a pope, the consecration of a bishop, the canonization of a saint, a religious profession, the publication of a treaty of peace, a royal coronation, etc. It is sung either after Mass or the Divine Office or as a separate religious ceremony. The hymn also remains in use in the Anglican Communion and some Lutheran Churches in similar settings. The petitions at the end of the hymn (beginning Salvum fac populum tuum) are a selection of verses from the book of Psalms, appended subsequently to the original hymn. The hymn follows the outline of the Apostles' Creed, mixing a poetic vision of the heavenly liturgy with its declaration of faith. Calling on the name of God immediately, the hymn proceeds to name all those who praise and venerate God, from the hierarchy of heavenly creatures to those Christian faithful already in heaven to the Church spread throughout the world. The hymn then returns to its credal formula, naming Christ and recalling his birth, suffering and death, his resurrection and glorification. At this point the hymn turns to the subjects declaiming the praise, both the universal Church and the singer in particular, asking for mercy on past sins, protection from future sin, and the hoped-for reunification with the elect. The text has been set to music by many composers, with settings by Haydn, Mozart, Berlioz, Verdi, Bruckner, Furtwängler, Dvořák, Britten, Kodály, and Pärt among the better known. Jean-Baptiste Lully wrote a setting of Te Deum for the court of Louis XIV of France, and received a fatal injury while conducting it. The prelude to Marc-Antoine Charpentier's setting (H.146) is well known in Europe on account of its being used as the theme music for some broadcasts of the European Broadcasting Union, most notably the Eurovision Song Contest. Earlier it had been used as the theme music for Bud Greenspan's documentary series, The Olympiad. Sir William Walton's Coronation Te Deum was written for the coronation of Queen Elizabeth II in 1953. Other English settings include those by Thomas Tallis, William Byrd, Henry Purcell, Edward Elgar, and Herbert Howells, as well as three settings each by George Frideric Handel and Charles Villiers Stanford. Puccini's opera Tosca features a dramatic performance of the initial part of the Te Deum at the end of Act I. The traditional chant melody was the basis for elaborate Te Deum compositions by notable French organists Louis Marchand, Guillaume Lasceux, Charles Tournemire (1930), Jean Langlais (1934), and Jeanne Demessieux (1958), which are still widely performed today. A version by Father Michael Keating is popular in some Charismatic circles. Mark Hayes wrote a setting of the text in 2005, with Latin phrases interpolated amid primarily English lyrics. In 1978, British hymnodist Christopher Idle wrote God We Praise You, a version of the text in 8.7.8.7.D meter, set to the tune Rustington. 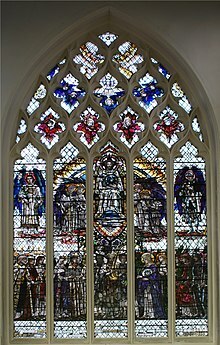 British composer John Rutter has composed two settings of this hymn, one entitled Te Deum and the other Winchester Te Deum. Igor Stravinsky set the first 12 lines of the text as part of The Flood in 1962. Antony Pitts was commissioned by the London Festival of Contemporary Church Music to write a setting for the 2011 10th Anniversary Festival. The 18th-century German hymn Großer Gott, wir loben dich is a free translation of the Te Deum, which was translated into English in the 19th century as "Holy God, we praise thy name." In the Book of Common Prayer, verse is written in half-lines, at which reading pauses, indicated by colons in the text. A Te Deum service is a short religious service, based upon the singing of the hymn, held to give thanks. In Sweden, for example, it may be held in the Royal Chapel in connection with the birth of a Prince or Princess, christenings, milestone birthdays, jubilees and other important event within the Royal Family of Sweden. In Luxembourg, a service is held annually in the presence of the Grand-Ducal Family to celebrate the Grand Duke's Official Birthday, which is also the nation's national day, on either the 23rd or 24th June. 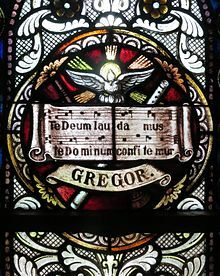 "Te Deum" from Morning Service in E-flat major by John M. Loretz, Jr.
^ Authorship of Nicetas of Remesiana was suggested by the association of the name "Nicetas" with the hymn in manuscripts from the 10th century onward, and was particularly defended in the 1890s by Germain Morin. Hymnologists of the 20th century, especially Ernst Kähler (1958) have shown the association with "Nicetas" to be spurious. See: C. P. E. Springer, "Te Deum" in: Theologische Realenzyklopädie (1976), 24f. ^ Brown, Rosalind (19 July 2009). "On singing 'Te Deum'". www.durhamcathedral.co.uk. Retrieved 2019-03-01. Herbermann, Charles, ed. (1913). "Holy Innocents". Catholic Encyclopedia. New York: Robert Appleton Company. Retrieved 2010-04-14. ^ "General Instruction of the Liturgy of the Hours". Retrieved 2007-12-02. ^ "Te Deum". Retrieved 2011-12-31. ^ "The Te Deum (cont.)". Musical Musings: Prayers and Liturgical Texts – The Te Deum. CanticaNOVA Publications. Retrieved 2007-07-07. ^ "Christopher Idle". Jubilate.co.uk. Archived from the original on 2015-07-22. Retrieved 2014-07-21. ^ "The Worshiping Church". Hymnary.org. p. 42. Retrieved 2014-07-21. ^ "lfccm.com". lfccm.com. Retrieved 2014-07-21. ^ "Holy God, We Praise Thy Name". Cyberhymnal.org. Retrieved 2014-07-21. ^ "Te Deum". www.kungahuset.se. Swedish Royal Court. Retrieved 2 May 2016. ^ "National Day in Luxembourg". www.visitluxembourg.com. Retrieved 2018-03-14.